A lot of brilliant people are making some phenomenal progress in credit card processing and card security methods, and this new method of using your webcam to capture credit card data for purchases sounds intriguing. They have some of the nitty gritty in the press release, but I’ll try to break it down somewhat. Right now when you buy stuff online, you have to manually enter your credit card data. And a lot of personal data. I think most retailers require billing address, CC number, CVV, and blood type. All this data is encrypted a TON and fired off to the retailer, who then runs the card and sends you some coulottes or mustache wax. I buy weird stuff. What’s really unfortunate is that the data can still be compromised/captured en route to the PC via keyloggers and other assorted malware designed to steal your stuff. Enter Jumio and Netswipe. Rather than hand enter data, your webcam opens a secure connection to an authentication service, and you hold your card in front of the webcam while it gets a read. It might also see your messy apartment, but I don’t think it will judge. You use your mouse to enter the CVV so keyloggers just see some clicks, and the transaction’s complete. They mention that this could be used at businesses as well, my guess would be via a 2D barcode scanner that can also capture images. I think Netswipe has the potential to minimize a lot of fraud that occurs online. You actually need the card to make the transaction, so you cut back potential users to those who own the card, or may have physically stolen it. Although a well-printed duplicate may also work, I’m not sure how that plays out. Since the CVV is entered by mouse clicks instead of keystrokes, you also eliminate another chunk of data that could be stolen. My only worry would be malware designers building for this new capture method, where they either capture the video stream, or set the camera to take a still image after the transaction’s complete, so then they get a nice crisp image of the card instead of the keyboard-entered data. But I’m sure the Jumio developers are looking at a variety of ways to minimize abuse. In the meantime, there are methods to secure transactions at the point of sale. The MagTek Centurion card reader offers hardware encryption that is only decrypted by your credit card processor. I’ve mentioned previously that businesses are starting to get fined for data breaches, so taking steps to secure sensitive data now will definitely save you time and money in the long run. Hey so the Motorola MC3000 is toast. It’s been replaced by the MC3100 which is 100 better. There’s more to it than that, but I like to think that model numbers directly relate to the difference in capabilities of products. The MC3100 sports the same build types as the older mobile computer: Straight Shooter Brick Thing, Rotating Laser Turret of Doom, and Traditional Gun-Style. You get your choice of Windows CE 6.0 Pro or Windows Mobile 6.5 Classic, so it should be compatible with most mobile inventory/sales apps. A 624 MHz Marvell PXA320 processor powers the device, along with 256 MB of RAM and either 512 MB or 1 GB of Flash memory. There’s also an SD card slot on it in case you want to load the scanner up with Starland Vocal Band. Or picking lists. For scanning, you get your choice of Moto’s laser scan engine (SE950) or their blockbuster 2D scan engine (SE4500-HD). The Rotating Turret model only comes with the laser scanner, I guess rotating imager technology doesn’t exist yet. For scan range, the laser gives you 15″ of optimal scanning on 100% UPC barcodes, and the imager can read the same barcodes from almost a foot out. As always, your mileage may vary depending on the density of the barcode. Motorola built the MC3100 to be pretty durable, giving you similar capabilities to their high-end industrial line while not breaking the bank. The operating temperature for the mobile computer is -4 to 122 F. -4 degrees Fahrenheit. That’s just frigid. But the MC3100 will keep humming along at that temperature while you’re wondering who told you -4 isn’t that cold. It also sports an IP54 seal, so windblown dust won’t get inside the body, nor splashes of water from any angle. That combo could make it a good choice for cold storage inventory management, or maybe penguin tracking or something. 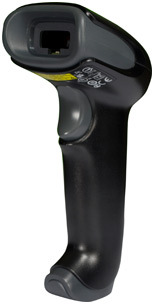 In all, the Motorola MC3100 offers similar durability to the high-end MC9000 while not costing nearly as much. Some bells & whistles are eliminated, such as long range scanning, cellular radios, or a heavier duty environmental seal, but you still get tremendous features for data management within the four walls. Honeywell’s continuing their migration toward a single cabling setup, this time unleashing the Voyager 1250g onto the world. It’s a laser scanner built like more common triggered barcode scanners, and kind of looks like a 3800g/Hyperion 1300g with a laser scan engine crammed into it. The scan engine on the 1250g is a tuned up version of what you get in the standard Voyager, giving you faster scanning at a longer range. The optimal scan range for standard UPC barcodes is contact to about 18″ back, so it’s pretty easy to get a read at any checkstand. It scans 100 barcodes per second, on par with the LS2208 and VoyagerGS, and pretty solid for retail. Honeywell tuned the 1250g to scan 4 mil barcodes as well. While that’s not as spectacular as the Voyager 1200g reading 3 mil barcodes, it’s still pretty great, especially when you add in the deeper scan range. And it’s one of the few laser scanners on the market that can scan in direct sunlight (according to their data sheet). CodeGate is available on the scanner, so it’ll illuminate the barcode but not scan until you pull the trigger. For electronics retailers and cell phone providers, this is a tremendous feature. Any time you have more than two or three barcodes really closely packed together, like on most cell phone, hard drive, or consumer electronics boxes, reading the correct barcode can be troublesome. CodeGate takes care of this issue and definitely speeds up operations. Durability is important even in retail environments, and Honeywell built the Voyager 1250g to take a beating. The scanner can withstand drops of 5 feet to concrete, so knocking it off a counter shouldn’t be too big a deal. It’s also got an IP41 seal, which protects the internals from some dirt and a little water. I definitely would hesitate to put it through a car wash, but it should be fine during a sidewalk sale or at a lumber yard or anything short of a thunderstorm. The Voyager 1250g is a solid solution and does feel like it offers features of the Voyager 1200g and the Hyperion 1300g. Probably why it’s the 1250g. You get the speed of a laser scanner, but the range more commonly associated with imaging. I could see this being a great upgrade for most retailers. Once I get my hands on a 1250g, I’ll run it through its paces, including the hammer test. It looks like a 3800g, hopefully it can hammer nails like a 3800g. 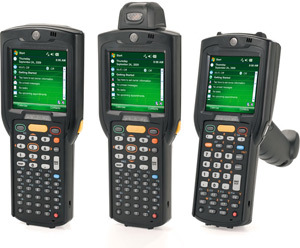 Unitech, purveyors of fine barcode scanners & mobile computers, have upgraded their PA500 mobile computer series with the newer, sleeker, fancier PA550. The newer model skirts that same smartphone/data collector line as the Moto ES400 or Honeywell Dolphin 6000, and it should be a good fit for people needing beefy computing and a phone in one pocket-sized device. Personally, I’m glad Unitech moved the PA500-series away from what it originally was. When the PA500 and PA600 were both released, they offered similar specs but the PA600 was more durable. We tend to lead with what customers aren’t going to break, and so the PA600 would get the nod over the PA500. I also preferred the PA600’s keypad to the PA500’s 5-key, PDA style keypad. The new PA550 gives the line a very distinct aesthetic and puts it in a portion of the market the PA600 doesn’t necessarily target, so I could see the two devices complementing each other well. 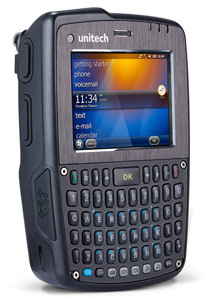 The PA550 runs Windows Mobile 6.5, so you get backwards compatibility with legacy Windows Mobile/Windows CE software, such as RedBeam Inventory Management or Proxis Stock Manager. It has a pretty beefy processor & enough RAM to keep those apps running smoothly. For extended storage, a microSD slot supports high capacity cards, for any crazy ringtones or order fulfillment forms you might need. You get a 3.5G WAN radio in the PA550, compatible with GSM/GPRS/Edge networks. Unitech also offers a model with a 6 month data plan at no extra charge, to really show off what you can do with the PA550. Like download route maps while on the road, or settle bets on whether it’s “for all intents and purposes” or “all intensive purposes.” That’s a good bet to settle, especially if you plan on using one of the phrases while on a sales call. 802.11b/g comes standard and offers connectivity within the four walls, or at Starbucks, which is great if your cell data plan has limits. The PA550 also ships with Bluetooth built-in, in case you want to be that guy wearing the Bluetooth headset all over everywhere. You could also use it with a fancy cordless scanner, too, or maybe a Bluetooth portable printer. Unitech also added a Ublox NEO-5Q GPS radio with KickStart technology. I guess the combo gives you greater location precision even in weak signaling environments, so like indoors or under heavy cloud cover or something. Though it’s shaped like a Blackberry, when it comes to durability the PA550 is anything but. Sporting a “sneeze-proof” IP54 environmental seal, the PA550 should hold up to splashes of water or dusty environments no sweat. The reinforced body should withstand drops of 4 feet, so falling off a trunk or out of a pocket should be okay. Maybe not off the top of a van. But still, most consumer phones would cease to be after a 4-foot fall. You also get, in the PA550, a smartphone that can operate in temperatures as low as 14 degrees Fahrenheit. My phone acts weird if it gets below freezing, probably as a reminder to go outside and play in the snow, so being able to operate properly at that temperature is going to be fantastic for field crews in colder climates. The Unitech PA550 is a great fit for mobile sales crews, or even line busting at your business. I could see it working well for mobile concessions at a stadium. Paired with a Bluetooth printer/msr and some payment processing software, you could sell beer at Lambeau and take cards as well as cash. Just make sure not to serve those metal bottles, you’ll get a tongue on a flagpole situation, never pretty.